WBS Schedule Pro contains a WBS Chart feature for planning and managing projects using a Work Breakdown Structure (WBS) Chart. WBS Charts display the structure of a project showing how a project is organized into Summary (phase) and detail Task levels. Using a WBS Chart is a more intuitive approach to planning and displaying a project. As a planning tool, use the WBS Chart in WBS Schedule Pro to quickly sketch a project plan on the screen using a "Top-Down" approach. 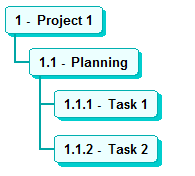 Click with the mouse to define Phases (Summary Tasks) and Subtasks. Doubleclick a task to add schedule information like Duration, Start Date, Finish Date, Cost, Work, etc. Click and drag to reorganize the tasks in the chart. Your WBS Charts can be managed separately or transferred to Microsoft Project or numerous other Project Management software applications. As a display tool, WBS Charts can be created from your existing Microsoft Project plans or from other Project Management Software. The structure that you've already created in your project can be displayed in a clear and concise breakdown of Summary and Detail Tasks. As you define the structure of your project, information is automatically rolled up to each level of the WBS. Project data such as Work, Duration, and Cost can be viewed at each level and summarized from the lowest levels all the way to the top. You can even define your own custom Work, Cost, Duration, Number or Date fields and Roll this information up as needed. The WBS Charts in WBS Schedule Pro are highly customizable. Color the boxes in the chart based on whether a task is Critical or Non-Critical, by the Progress (% Complete) of a task or based on Level. Or, create your own custom coloring criteria. Choose how boxes are arranged, adjust the spacing between boxes and even remove box borders and shadows to create a more compact chart. The possibilities are endless. Loaded with features to not only make it easy to create, plan and manage your projects but to allow you to produce the WBS Charts that you need with the information that is most important to present. We encourage you to explore some of the key features of WBS Charts by clicking the links in the upper right corner of this page or Download the software and try it yourself! "Hands down the best software I've ever used for producing Work Breakdown Structures. So simple but at the same time so powerful. It produces exactly the types of charts I need to convey my project to others. Much easier to understand than a Gantt chart."